The top green on the tree gives it priority and should remain saturated or even moreso. Similarily for the top orange on the house. These two colors make that element not be part of a background. Almost all the other colors in their respective ramps could be playfully tinted if you so desire without any lack of clarity or priority, so unless there's a great reason not to, why not? The rock face I brightened up I did so it would look like an obstacle, which needs more priority than a background element you would merely walk over. I tinted its shadows towards green to merge it a bit with the green floor tile. The dirt shore color in your version seemed too bright, almost metallic or as if it's something edible so I moved the luma down a little and made it vaguely more warm. The water - buffer - dark reflection was almost a straight ramp which gave ti me the impression that this is a manufactured toy world, so I made the darker color tint in the direction of the rocks themselves. On the tree trunk I introduced green tints to complement the foliage and left the pleasing blue secondary ambient lightsource in-tact. The biggest change is dampening the green field color a bit, a choice on which I'm a bit ambivalent but it would probably work out in terms of priority. A cost/benefit for losing that vibrant green, not sure if it's the best choice. 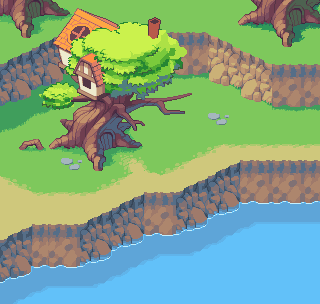 I changed the color of the cast shadow of the sprite because before it was the darkest and most saturated color in the mockup, not sure if you want a shadow to be the secondary focal point of the mockup after the saturated green foliage. My overall impression is that your coloring method is a bit primary; not a bad thing in itself but it makes things look a bit plastic, the wonder of the natural world is how the whole is very complementary, mixed and complex. I like the image overall, but I don't think that your faint rocks compared to your crisp treehouse is doing you much good. In my opinion, the rocks would look better if they followed the same colour style as the rest of the image. Damn, that's a really nice update. The warmer green for the grass really helps the happy atmosphere, I think. Also I think you can play up the highlights and shadows to achieve more pop. Emphasising the ambient light can push the kind of mystical fantasy feel a bit, if that's what you want to go for. You seem to have a lot of colours you could cull, especially if you go for the more mixed hues in your ramps. Thats an insanely awesome edit eyecraft. It's been making me contemplate moving towards a slightly more realistic rendering style. Lots of great ideas to try out. I addressed a number of issues. I made the shadowed areas a tad more blue over-all. I started doing some edge-treatment to the cliffs. I still haven't touched the front facing cliff-side at all. I darkened the shadows a bit more so objects can feel more grounded in the scene with such bright grass. a few other things too. So will the chimney be worked on more or will it remain the same? This is looking great so far! Very cheery colors. I would add a transition tile between the diagonal and the flat-facing cliff angles. As it currently is, it looks like rectangular stripes.